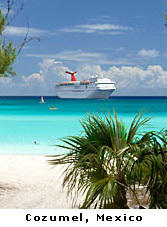 Experience the Western Caribbean "Fun Ship" Style! There is no better way to esperience the Western Caribbean than onboard the beautiful Carnival Elation out of New Orleans, LA. Rates are per person, based on double occupancy and subject to availability. Government fees/taxes ($17 to $299) are additional per guest. Restrictions apply. Carnival reserves the right to re-instate the fuel supplement for all guests at up to $9 per person per day if the NYMEX oil price exceeds $70 per barrel. *Rate does not include port charges and government taxes of $170.42 per person and is based on double occupancy. Inside rate is based on a category 4B. Ocean rate is based on a category 6B. Rates are subject to change and are based on availability at the time of booking. Additional cabin categories may be available at the time of booking. A non-refundable deposit of $25 per person is required to reserve your stateroom. 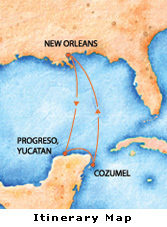 A second deposit of $175 per person is due by July 01, 2013. Final payment is due by September 01, 2013. Triple, Quad and Suite staterooms require the full $200 per person deposit at the time of booking. Space is limited! Contact your GlobeTrek Travel Agent TODAY to reserve your stateroom.